This recipe is the photo that has been the banner of my blog from day one. It’s light, colourful and packs a mix of flavours that aren’t commonly seen together. I’m heading up to the cottage for May 24 weekend, and this is the type of thing that’s perfect up there along with a veggie burger. I made the portions for this recipe to only serve one person (since that’s how I made it myself) but double up if you have company. If you don’t love spice, feel free the dial down the hot sauce in the dressing. It won’t hurt the salad at all, you could even replace it with an Asian-tasting sauce of your own if you have one on hand. I like the mix up the dressing a little bit each time just to try something new, but the ingredients I listed for the dressing are the basics. Sidenote: This is unrelated to this recipe, but I found out something interesting about absorbing iron for any of you who are concerned about this. Apparently, when you pair up iron-rich foods with calcium, it makes it difficult for your body to absorb any of the vitamins. For example, eating a spinach omelette with cheese could lower the amount of iron you intake. BUT vitamin C and citrus-rich foods are supposed to help absorption of iron–just something to keep in mind for all you vegetarians. 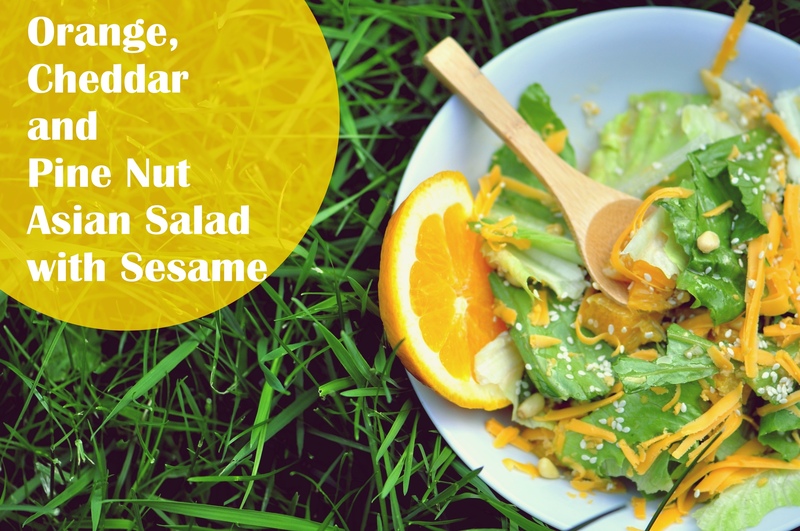 Combine lettuce, orange, cheddar and pine nuts in a salad bowl. 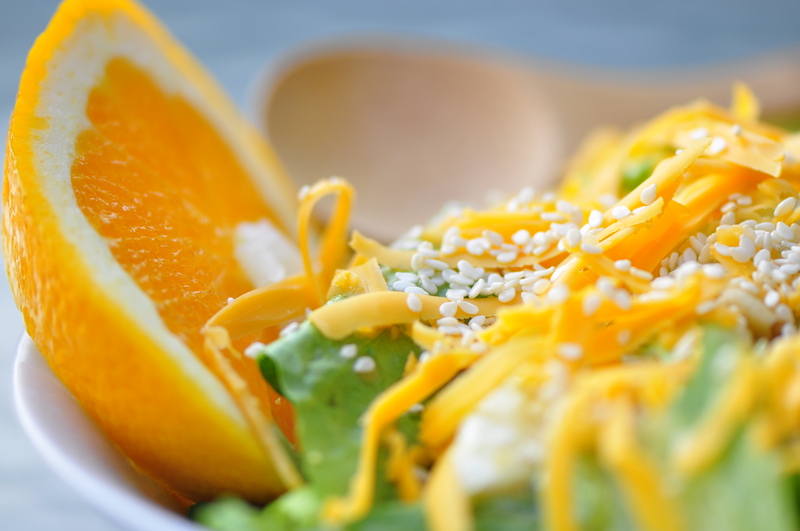 In a separate smaller bowl for the dressing, whisk together sesame and vegetable oil, hot sauce, soy sauce and orange juice. 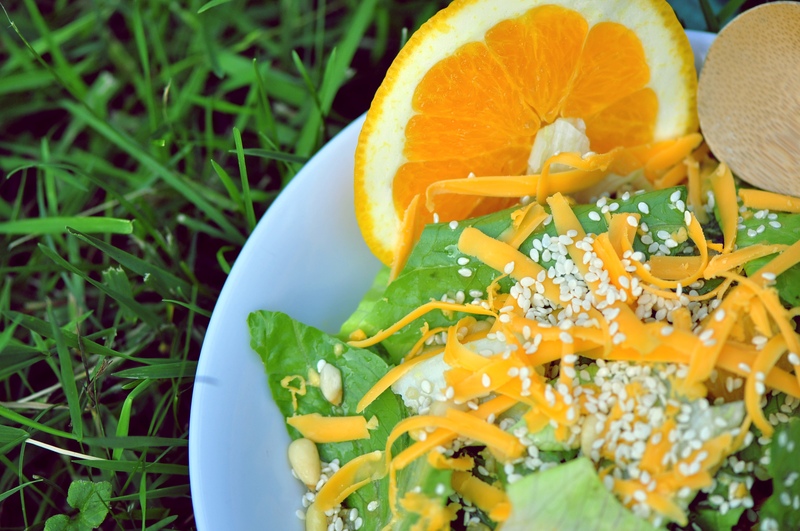 Drizzle the dressing over the salad mix and sprinkle sesame seeds on top. Did you create this amazing site yourself? Please reply back as I’m wanting to create my very own site and would like to know where you got this from or exactly what the theme is called. Cheers! Hey there! Someone in my Facebook group shared this website with us so I came to look it over. I’m definitely enjoying the information. I’m bookmarking and will be tweeting this to my followers! Thanks so much! I’ve never really had much trouble getting started but I normally just think about the background of the food, where I first heard about it, what’s going on in general…just things I can easily write about and likely link back to the food.